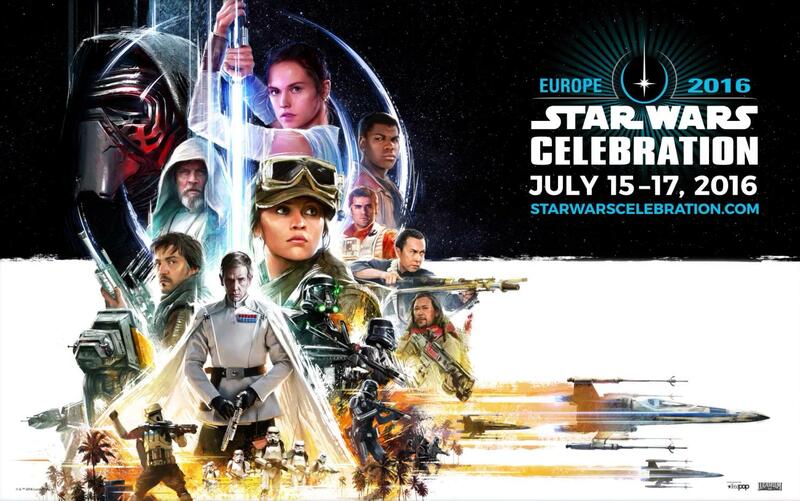 Today, Disney released the official poster for Star Wars Celebration Europe, which is set to take place in London on July 15. Star Wars Celebration events are official Lucasfilm-sanctioned events, and it’s also where Disney releases more info about the upcoming movie. So let’s put on our Rey goggles and analyze! Despite Disney’s claims of the Rogue One leak being “mostly incorrect”, we’re betting Director Krennic is the name of Ben Mendelsohn’s character. And we get our clearest “official” look at him yet in this poster. 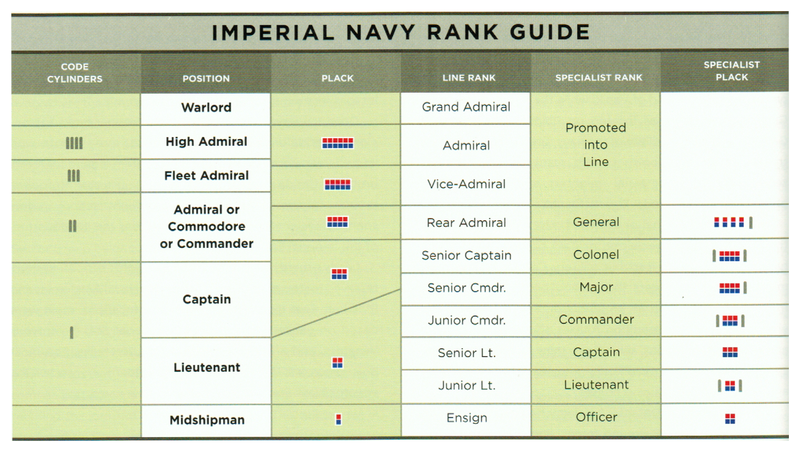 High Admirals were just one rank lower than Grand Admiral, and were on the same level as Grand Moff (twelve squares). They were a step up over Moffs and Vice Admirals (ten squares). 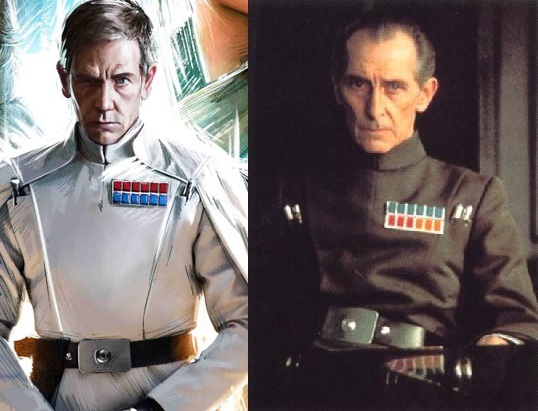 So in Rogue One, it seems that Director Krennic and Grand Moff Tarkin are on par with one another, with none being subordinate to the other. They also sport the same belt buckle, which must be de riguer for military officials. And either those are code cylinders, or both of them like to carry a bunch of pens. Unlike the armored Death Trooper and regular stormtrooper, Scarabs dispense with the armor in the codpiece, thighs and upper arms. 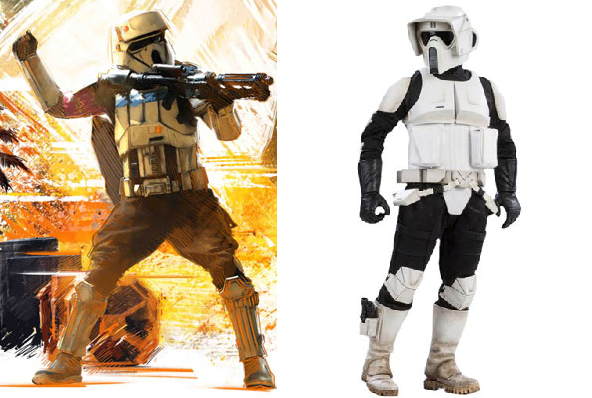 This makes them similar to the Scout Trooper. 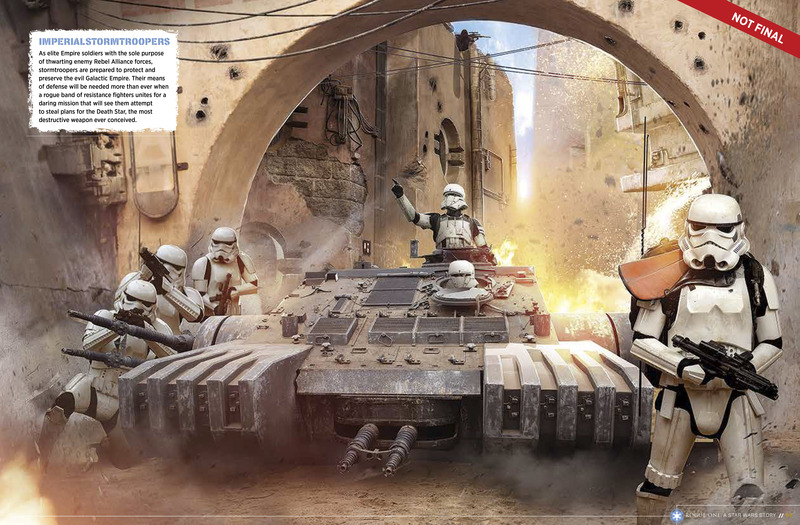 Scarabs could be the Empire’s equivalent of the US Marines’ QRF (quick reaction force) – lightly armed, but faster and able to deploy more quickly than a normal complement. 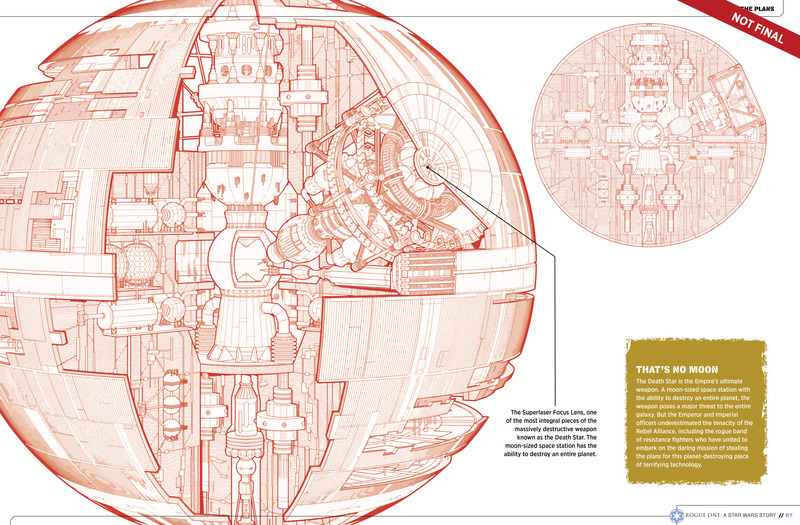 They could also be the crew of the Empire’s mechanized forces. We’ve already seen the hovertank in the trailer with a Scarab on top. In the real world, crew members of tanks and APCs wear lighter helmets and less body armor than their infantry counterparts, so they can easily dismount in case of an emergency (like a burning vehicle). 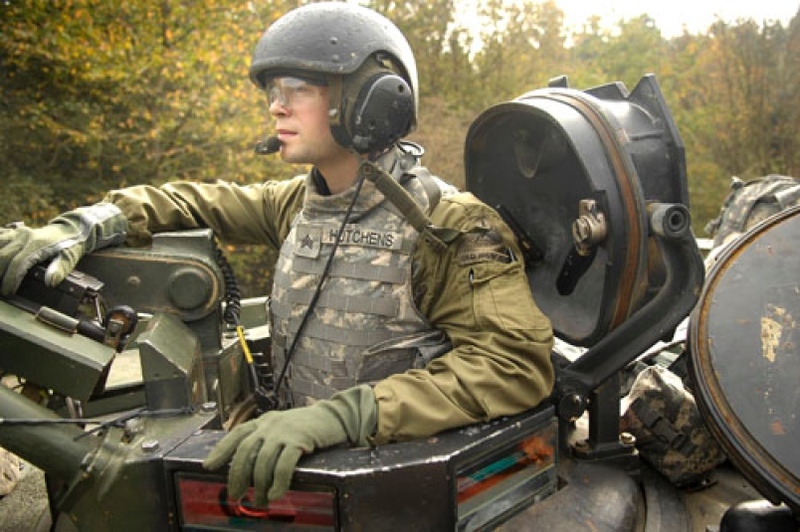 For example, this US Army tank gunner wears a Combat Vehicle Crewman helmet different from the regular PASGT helmets. He also dispenses with the cumbersome kevlar panels worn by US army infantry. The body armor, not just the helmet, is definitely different from the regular stormtrooper. Previously, shadowtrooper variations in EU only colored the stormtrooper black without any difference. if you’re a 501st member, get ready for a whole new set of guidelines! The green glow at the mic tips seems pretty stupid. While they look cool from a Hollywood perspective, it’s inconceivable why the Empire would light their special forces troopers like that if they’re supposed to be stealthy. Maybe it’s light leakage from their night vision system? Or maybe they are convenient hands-free lights, for reading maps in the field. How thoughtful of the Empire! It also has a striking tan panel on the side. Perhaps those are interchangeable modules and this walker carries cargo, with the tan panel being a pallet that can be easily swapped. Hence the “C” in AT-ACT. Is it just us, or does his walking stick turn into some sort of gun / bowcaster thingy? You know the galaxy’s really gone downhill when “religious” guys carry a bunch of weapons. And that’s it for now. Stormtrooper Larry needs to get back to work! 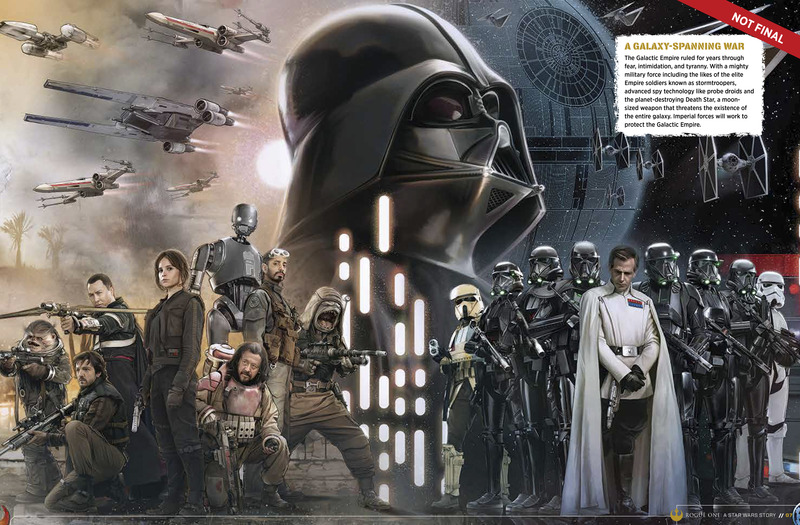 Massive Star Wars: Rogue One LEAK! 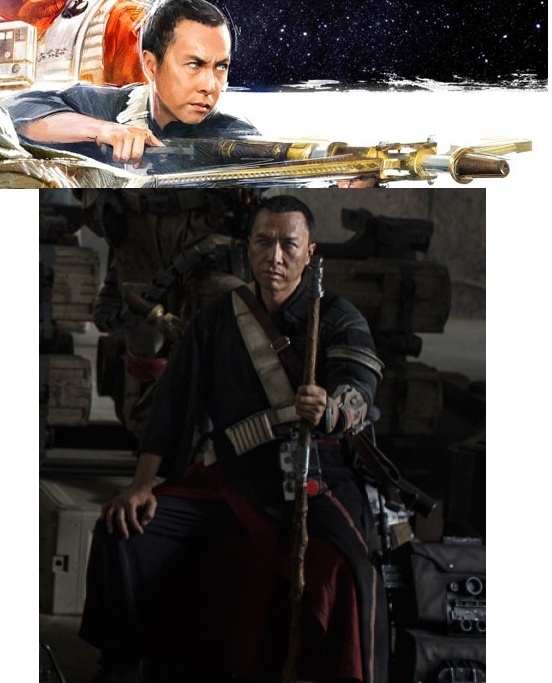 While the holonet has been full of Star Wars Episode VIII leaks, things have been suspiciously quiet regarding Rogue One. Stormtrooper Larry is happy to change that today with this massive data dump — the Death Star battle plans full intel on Rogue One! The intel comes from Edelweiss, a digital catalog used by booksellers and publishers. 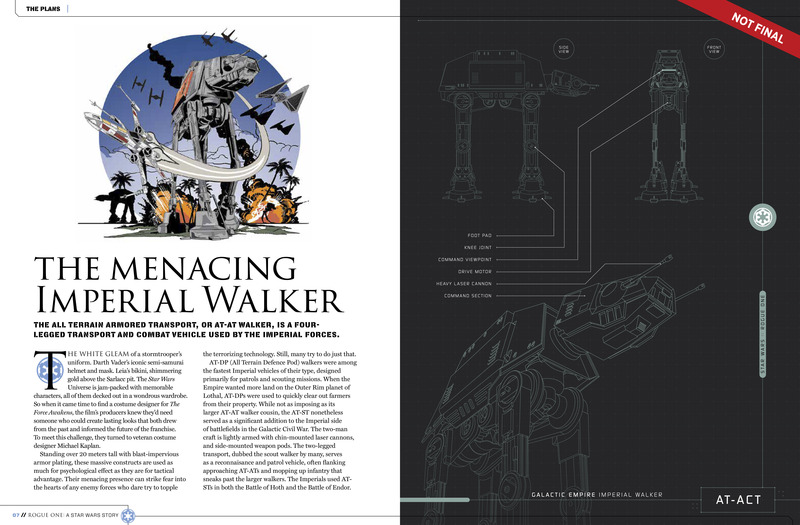 Someone, (an intrepid Bothan spy), uploaded the scanned content from an upcoming coffeetable book called Rogue One: The Official Visual Story Guide. 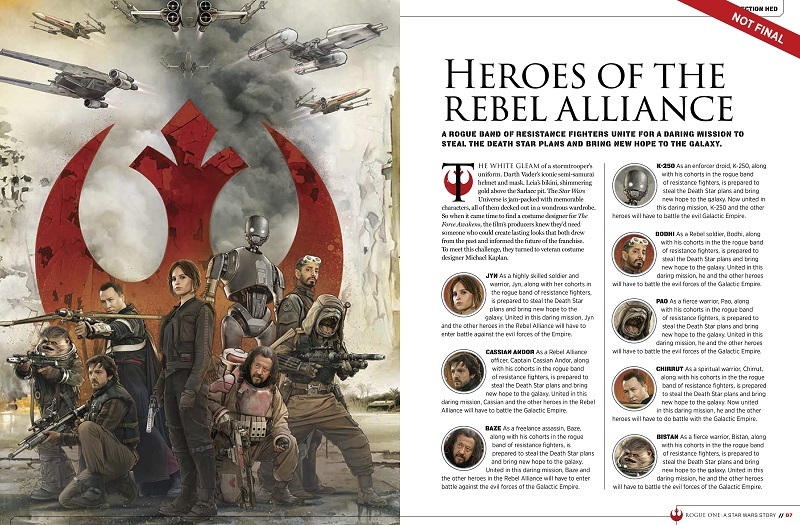 Not only does it include the full names of Jyn Erso’s rogue crew, it gives us the name of Ben Mendelssohn’s cloak-clad villain, as well as info on the Death Troopers, two new starfighters, and the predecessor of the AT-ACT. For what it’s worth, the scans are marked not final. So proceed at your own risk. And as always, SPOILERS AHEAD! 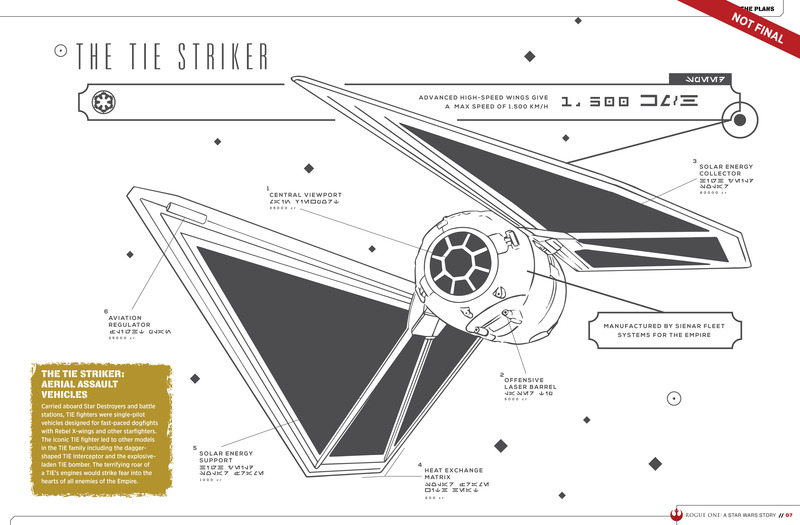 The TIE Striker sports high-speed wings that enable it to reach speeds of 1,500kph (the normal TIE fighter has a maximum atmospheric speed of 1,200kph according to Wookieepedia). 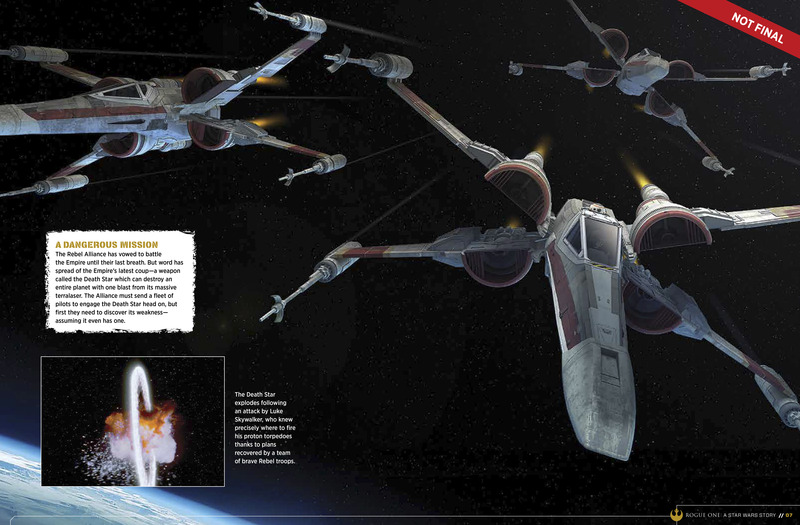 We noticed how the AT-ATs in the trailer differed from their ESB cousins. Pablo Hidalgo confirmed that they are “not technically AT-ATs”. That’s because they are AT-ACTs! Could they be All-Terrain Armored Combat Transports? While we don’t have photos, the text also confirms the existence of AT-DPs (All Terrain Defence Pods), which are two-legged, two-man platforms used for patrol and scouting missions. Look sir, droid! 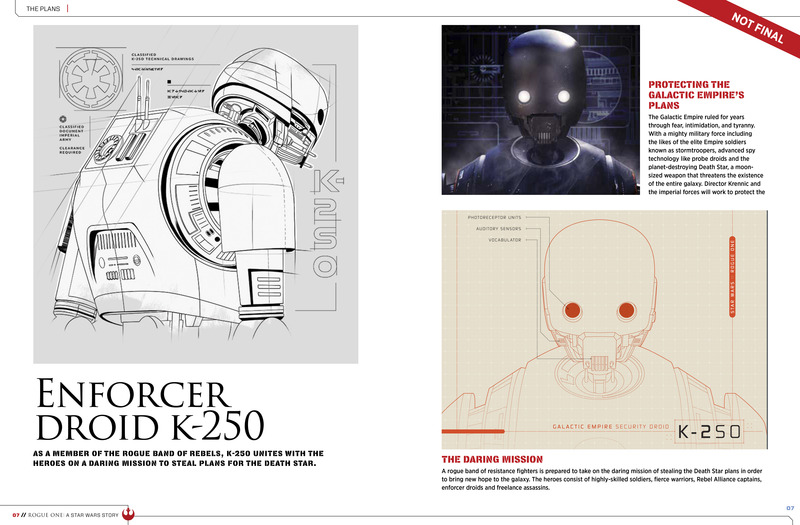 K-2S0 is a former Security Droid. He has the same “donut and two bars” back design as regular stormtroopers, but seems to have been reprogrammed by the Rebels. He will likely play a key role in infiltrating the Imperial base and letting our heroes in. Just for the heck of it, here are some more gorgeous photos that don’t tell us much. 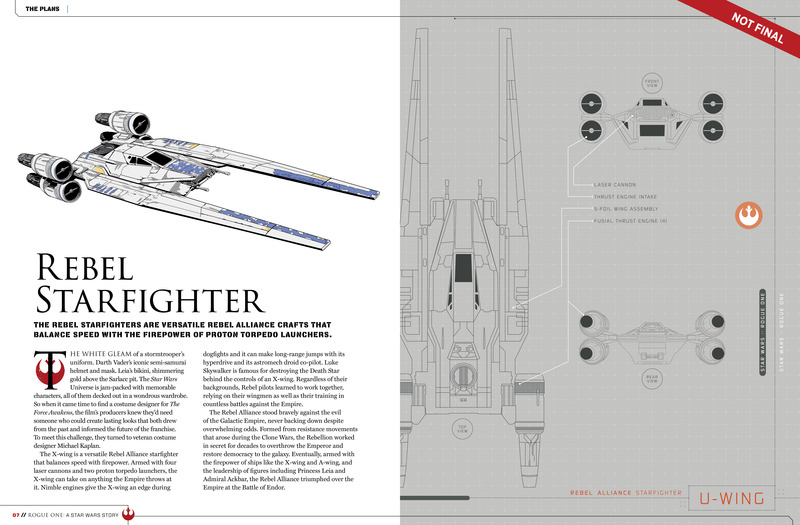 Although we do wonder what the T-70 X-wing from The Force Awakens is doing here. And finally, a group photo of the whole shebang. 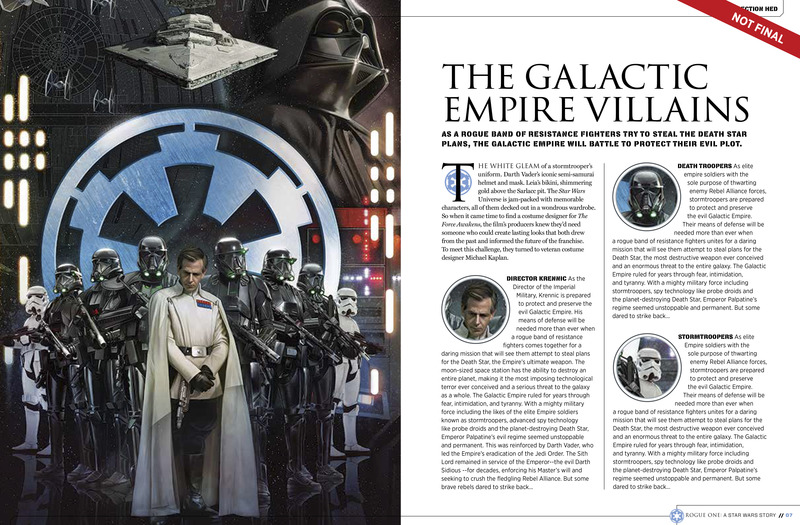 The source itself, Rogue One: The Official Visual Story Guide, will be released on Jan. 24, 2017. This is why the leak is full of filler text and “Not Final” disclaimers. The final book will be 164 pages long and cost around $25. Enjoy your Rogue One leak bonanza! 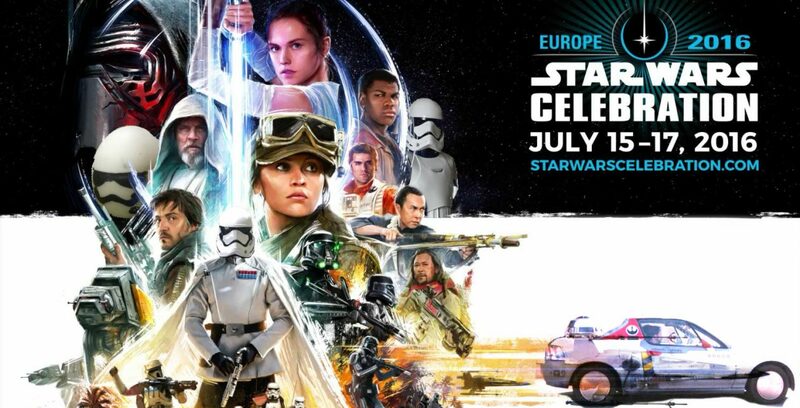 Disney has promised we’ll hear more during Star Wars Celebration Europe in July, but for now it seems our Bothan spies have pre-empted the Disney Empire! UPDATE: Disney has asked several sites to take down the leak, calling it “unauthorized and incorrect“. Can’t wait for the movies? In the meantime, check out this hilarious story how Ben Solo fell to the dark side!